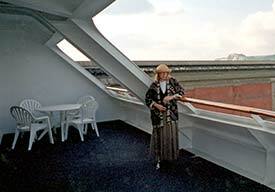 ABOVE: An "R"-class ship of Renaissance Cruises, circa 2001. 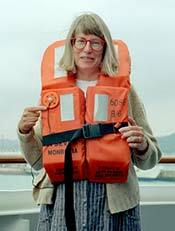 INSET BELOW: A lifejacket couldn't save our cruise--or Renaissance. We chose voyage R7010921, an 8-night itinerary from Dover, England to Amsterdam, Zeebrugge, Le Havre, St. Peter Port, Bordeaux, La Coruña, Porto, and Lisbon. We were to catch a Renaissance charter flight from New York's JFK to Dover on Friday, September 21. On September 11, 2001, Al-Quaeda terrorists flew airplanes into New York's World Trade Center, the Pentagon in Washington, and a field near Shanksville, Pennsylvania. A few days later, Brad Ball phoned to say that the terrorist attacks had led to some cancellations, so he was upgrading us from a standard cabin to an Owner's Suite. Having never slept in a ship's cabin without bunk beds, we protested that an Owner's Suite was too fancy for simple folks like us, but Brad was adamant: "This is a great chance to experience our suites," he said, so we resigned ourselves to 8 nights of luxury at sea. When we boarded the R7 on September 22, we learned that there had been a lot of cancellations: about 300 for our cruise on the 678-passenger R7, and possibly thousands throughout the Renaissance fleet. The ship was sailing half-full, but the passengers--who had refused to be frightened away by terrorists--were in a good mood (albeit with one somber moment during a visit to Canterbury Cathedral before our departure, where the church authorities had set up an impromptu memorial to September 11's victims). 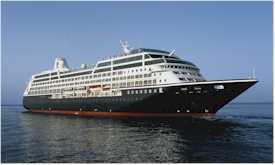 We sailed from Dover at 6 p.m. on Saturday, September 22, reaching Amsterdam the next morning. Because Brad had asked us to try a handful of shore excursions, we we took a "Windmills and Cheeses" tour. That evening, the ship departed for Zeebrugge, where we took a bus into Bruges after our arrival the next morning. On Tuesday, we arrived in Le Havre, where we sampled a "Romantic Honfleur" tour before returning to the port city which we'd visited on the S.S. France, the Mikhail Lermontov, and the Alexandr Pushkin in earlier decades. That night (September 25, 2001) the R7 sailed from Le Havre at 9:00 p.m.
A little after 10 p.m., I felt the ship turn sharply to starboard, which seemed odd when our next port was to the south in Guernsey. I turned on the TV and switched to the navigation channel, where a GPS-based map showed the ship's position and course. We were heading north. I said to Cheryl, "It looks like we're going back to Dover." Something obviously was afoot, and the situation became more mysterious when the navigation map suddenly disappeared from the TV screen. While Cheryl had a shower, I went upstairs to the Internet room and checked my e-mail. I had a messsage from Anita Dunham-Potter (About.com's former Air Travel Guide) that asked, "Durant, did you know that Renaissance Cruises has gone bankrupt?" When I opened the Renaissance Web site, I saw a terse bankruptcy announcement. A few minutes later, I encountered the ship's social director and a magician in the elevator. "Has the crew been told that Renaissance has declared bankruptcy?" I asked. They were shocked and headed off to see what they could find out. The next morning, we woke up to an announcement by the captain over the PA system in our cabin. He explained that the line was bankrupt. The ship would be arriving in Dover shortly, where it would be "arrested" and held for the creditors. Fortunately, what ultimately happened was better (at least for passengers) than we'd feared: That evening, we were told us that we'd be flown to New York by charter jet the next day, and members of the crew would be repatriated to their home countries. Dinner was emotional for passengers and crew alike. As we entered the dining room, I pushed an envelope of cash into the Portuguese maitre d's hand for the serving staff, since the purser had warned that tips charged on credit cards (the usual procedure) would likely be seized by the creditors. The maitre d' shook my hand and asked solemnly, "May I kiss your wife?" Cheryl accepted a wet smooch on the neck graciously before we were led to our table. Later that evening, the entertainment staff--who had been told not to put on a show, since they wouldn't be paid--went ahead and performed anyway, to rousing applause and tears all around. During our final morning on board, several members of the buffet staff were sniffling or weeping at breakfast, but they gamely served up the usual array of food choices. Later, on the pier, other crew members loaded passengers' suitcases onto the buses that would take us to Gatwick Airport. There were many hugs, handshakes, and farewells between passengers and crew. Oceania Cruises acquired three of the ships (R1, R2, and R5, renamed the Regatta, Insignia, and Nautica), one of which--the Regatta--I reviewed here at Europe for Cruisers. The R3 and R4 became the Ocean Princess and Pacific Princess of Princess Cruises, the R6 became Azamara Journey, the R8 is now P&O's Adonia, and the R7--the vessel on our ill-fated voyage--is now the Azamara Quest of Azamara Cruises. We were fired by About.com on that same day--probably because we'd questioned the company's accounting practices, which led to a successful class-action lawsuit by About.com Guides. Within weeks, we'd launched our current site, Europeforvisitors.com, which is now one of the leading independent travel-planning sites on the Web. Brad Ball went on to become a Media Relations executive for Silversea Cruises, and we met him in person for the first time on a Silver Whisper cruise less than a year after the Renaissance brand sank beneath the waves. We've often wondered what happened to our Portuguese maitre d', our French stewardess and Macedonian steward, and other crew from the R7. We hope they found employment elsewhere, and we continue to be impressed by how bravely and nobly the R7's staff comported themselves after losing their jobs without warning in September, 2001. BELOW: Cheryl Imboden on the balcony of R7's cabin 6088.